The Mary Ward Centre is London’s Adult Education College with a difference. Our central London location makes it easily accessible, and students will enjoy the experience of working in a beautiful Grade II listed Georgian building in the calm surroundings of Queen Square. Courses run in the daytime, evening or weekend, meaning you can fit your learning around the rest of your life. The Mary Ward Centre has developed a reputation as the friendly place to learn – this is because as well as getting first rate teaching, students also receive the support and encouragement they need to help them get the most from their learning. Some of our courses, including some dance movement classes, take place at our other site near Holborn station – 10 Great Turnstile, WC1V 7JU. All classrooms are equipped with excellent facilities, technology and tools for each course. Students will be advised if they need to bring any additional materials. Courses are taught at all levels, from introductory to advanced, by experienced well-qualified tutors. From Art to Zumba, Archaeology to Ukulele, Computing and Business to Psychology and Counselling, there is plenty of choice to meet your interests. Many courses lead to a certificate so you can add to your qualifications but there is also lots of opportunity to pursue study purely for the pleasure of learning. 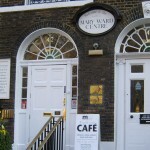 The Mary Ward Café is open to the public and is popular with students, tutors and staff as well as local businesses. The Centre also has a roof garden which is open to students, tutors and staff in the summer months. 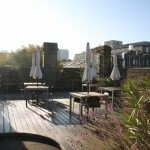 This is a space where you can bring your lunch, read, or just enjoy the view over London’s rooftop gardens.